Not often is a Royal Doulton mug a collector’s first pick at an auction house or local estate sale, however some of these can be worth a fair amount of money while being overlooked. The company first began in 1815 by John Doulton and after multiple name changes, began trading as the well known brand ‘Royal Doulton’ in the early 1900’s. Toby and Character ‘jugs’ are amongst the most popular Royal Doulton Mugs/Cups. Vintage Royal Doulton mugs can be worth a few dollars to a few thousand dollars so it is important to research the value of your item before you list it for sale. Toby Mugs also referred to as Toby Jugs are some of the most valuable vintage Royal Doulton pieces. These jugs were first produced by the company in the 1930’s and new designs were sold right up until 2011. These jugs are designed in a way that a character is shown from head to toe unlike Royal Doulton’s Character Mugs that are only one’s head and shoulders. 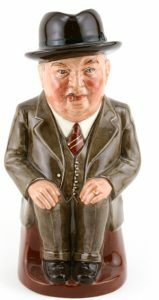 Toby Jugs can be found in miniature, small and large sizes and represent a multitude of famous men and women. 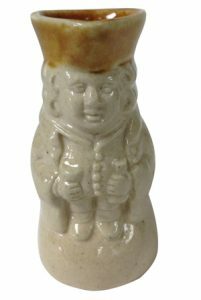 Although Royal Doulton was only one of many companies to create these jugs, the first Toby Jug made depicted a popular drunken character ‘Toby Fillpot’, from a 1700’s English/American song. During their time, these jugs were used to serve stingo (a strong alcohol) before later becoming a collectors item. Due to the colors, limited production periods and the variations between each jug, they have steadily increased in value over the years. Character Jugs (mugs) were produced after Toby Jugs. First produced by Royal Doulton in 1934, character jugs (mugs) were popular with the public from the beginning. Always sporting familiar iconic faces, the first character jugs created were of John Barleycorn and Old Charley. The production of these jugs was constant right up until WWII. In their time of production, every aspect of life was represented from Garfield the Cat to Henry VIII. During the 1900’s it was popular for each household to own a Royal Doulton Tea Set. Royal Doulton tea sets have held their value or increased in value. 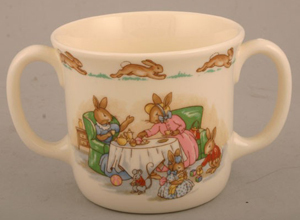 Bunnykins branded Royal Doulton cups and mugs are also popular vintage items due to the nostalgic value they have. Bunnykins has been produced by Royal Doulton for almost eighty years and features nursery patterned items. Made for a viewer of the ‘Jim’ll fix it’ show is the Toby Gillette Character Jug produced in 1984. This jug is the most valuable in Royal Doulton history with only three existing around the world. One of these jugs is kept in a Royal Doulton museum, another given to the viewer and the last recently sold for over $30, 000. 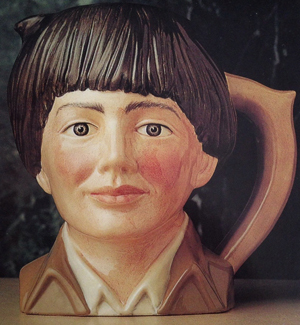 This jug depicts the young viewer himself with his brown bobbed hair and rosy red cheeks. Due to their extreme rarity, these jugs are now worth over $30, 000. It is unknown where in the world the two citizen owned Toby Gillette Jugs are. 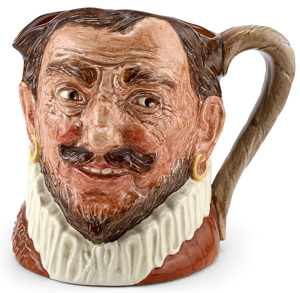 Just over 5 inches tall, the Drake character mug by Royal Doulton, represents Sir Francis Drake of England. Sir Francis Drake was well known for being the first man to travel around the globe. The original mug, which is hat-less is the most valuable variation and was produced between 1940-1941. A later model of ‘Drake’ was produced with a hat although does not hold the same value. An original ‘Drake’ without a hat produced during 1940-1941 can sell for up to $5, 500. 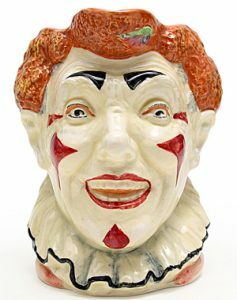 The ‘Clown’ character jug was first produced in 1937 by the Royal Doulton company. Designed by Harry Fenton, this particular mug is one of the most valuable within the collection. The first Clowns produced had either red or brown hair and a pale white face. This is important to note as later models created in 1951 had either black or white hair. Due to the rarity of an original clown with red hair, they can sell for up to $4, 500. Part of the Hollywood’s great series, is this representation of Clark Gable produced during 1984. Only 2000 of this large jug were ever produced making them rare. 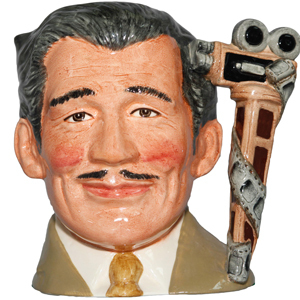 Clark Gable’s estate denied approval of this mug making the company end production. Still in existence, there is thought to only be 100 Clark Gable jugs in the world. A Clark Gable jug produced designed by Stanley J. is worth between $4, 000 – $5, 000. The earliest version of this jug had a yellow crown which was produced in 1938, followed by the 1939 version that had a brown crown. The value of the yellow crowned Old King Cole is much higher than the other variations. 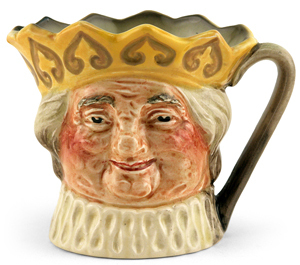 This jug was inspired by the nursery rhyme that states “Old King Cole was a Merry Old Soul”. Old King Cole was a very rich merchant that also makes an appearance in a novel by Thomas Delaney. An Old King Cole jug that sports a yellow crown is worth between $2, 500 – $4, 000. A white and tan painted figure of a standing man that is just over two and a half inches high. Created in 1925 by the Royal Doulton company this Toby jug is now quite valuable. Designed by Harry Simeon, this is one of the earlier Toby pieces produced. Today’s value of a miniature Standing Man Somber is upwards of $1, 500. Produced in 1935 this mug was designed by Charles Noke and Harry Fenton. 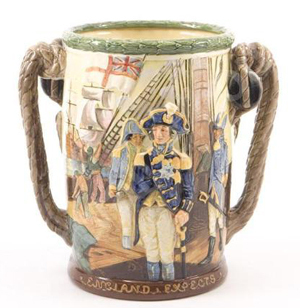 600 of these mugs were produced to celebrate Nelson’s victory. This mug is traditionally used at weddings and special occasions. This mug is worth $800 – $900. 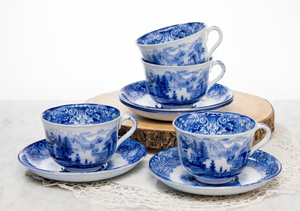 This set of four was made in 1900 England features blue and white tea cups and saucers. The value of the set today is upwards of $750. Multiple Cliff Cornell jugs were created each different in size and color. The rarest of the lot is the Cliff Cornell that wears a light brown suit as only 250 were every created. Created in 1956, this jug depicts a man in a light brown suit with a striped cream and brown tie. Cliff Cornell was a American Industrialist that wished for the jugs of himself be created so he could gift them in his absence. An original Cliff Cornell Toby Jug is worth approximately $500. Although there are many Bunnykins designed mugs produced from 1936-1937 . Although they are not worth a great deal when talking about money, often these mugs have a nostalgic value. These one and two handled mugs were often given as a present for a birth or first birthday. Each mug has a nursery themed image featuring multiple bunny rabbits.